I’ve only been wearing polish on my nails for about a month and I prefer a very dark polish. I’m not sure why-maybe because it doesn’t draw as much attention. But while shopping for some new polish, I couldn’t help but notice bright is THE way to go for spring. Yellows, greens, magenta and bright pinks, blues…it’s popsicle colors x 1000! 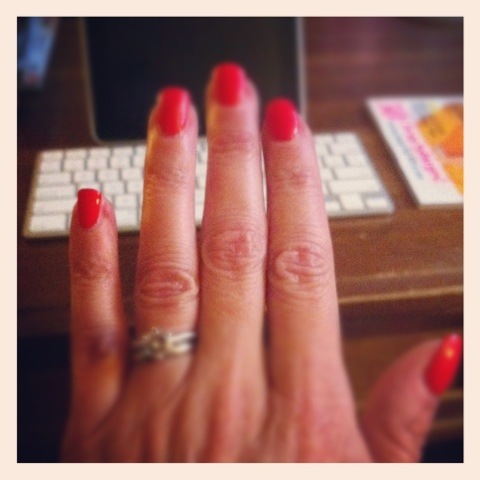 I decided to take a risk and bought a bright reddish coral by Essie called “Ole Caliente”. At first glance, I wasn’t a fan. I’m just so used to blackish red on my nails and this was just so bright. But after a couple of days I got used to it and actually started to really like it. Now, I’m ready to explore more pops of color and cannot wait for the new collaboration between hot designer Thakoon and Nars to appear in stores. 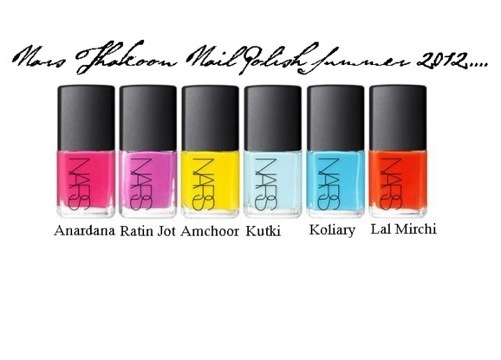 Inspired by his spring 2012 collection, these 6 shades are super vibrant and were inspired by the hues of Indian spice markets. I really love the light blue shade, Kutki. It will be so pretty with tan digits. I’ve used Nars polish in the past and it does wear really well. I’m not sure when the launch date is, but I am very sure they will sell out quickly. If there’s one you can’t live without, you’d better pre-order now! And if $18 is a little too much to spend on polish, try the spring collection from Essie. The colors are very fun, especially the light green. 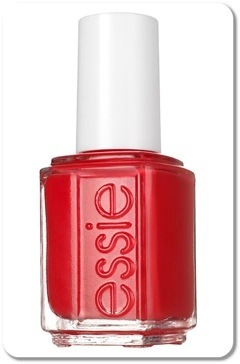 Essie spring polish $8 available at Ulta and most major drugstores. The good news is that everyone is doing bright shades for spring (check out Loreal’s Colour Riche) so there is definitely one to fit your budget!